Appearance: Moldof is broad of build and taller than most Inarta where he lives standing at 6'6". His hair is a dark golden brown in color with just a hint of red in it in the right light, while his eyes are a dark brown, almost black in color. He is stronger than he looks, even taking his size into account. This is in part due to the fact that he bears a great deal of weight on his large frame, much like his animal form. There are a few small scars on his abdomen, nothing impressive however. 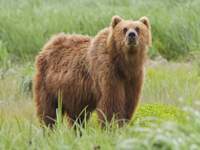 His animal form bears similarities to his human form in that it is large and has a similar color for the fur. He measures just over 8 feet in length and when on all fours stands at 4 and a half feet at the shoulders. As a bear he is over 1,245 pounds of fur, bone, and muscle. Small scars can be seen on his torso though are mostly covered by fur. Simply put Moldof wishes to become skilled enough in his chosen venue. Moldof was born in Wind Reach but was not an Inarta, but rather a Kevlic, from his mother whom had Kelvic ancestry. Not only was he born within Wind Reach but he was raised there as well. His childhood, or what amounted to it was what many would consider rough though it was also rather short due to his growth rate. He made friends easily for the most part, but has only kept in touch with a few, growing so fast compared to most of his peers had that sort of effect. He grew fast certainly, but despite that he has worked hard towards his goal, a simple yet lofty goal, to become accomplished enough. It has been a relatively short time since he became a Hunter Avora, just an apprentice but an Avora nonetheless. Most of his time has been spent hunting or honing his other skills but he has also learned more about WR and its people. He has learned not just about the Inarta, but also about their culture and main language, Nari, which he speaks rather well. He has also learned a bit about the other citizens of Wind Reach, most speak Common in addition to their native languages which he has picked up as well. In his time around Wind Reach he has learned about its basic geography and environment, information needed during his hunts. He has also learned a few words of Fratava, the language used by the Svefra, seafaring traders who come to Thunder Bay on occasion. Heirloom: Moldof's Heirloom is a Survival toolkit. House: It is in the Darniva Commonrooms. Last edited by Moldof on September 14th, 2018, 5:53 pm, edited 4 times in total.